Nikon has affirmed its belief in the newly developed XQD memory card format, which so far is only available in its flagship DSLR, the Nikon D4. 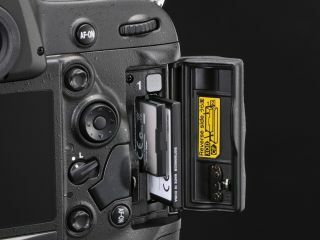 Many expected that the new memory card format would make it into the Nikon D800 when it was launched, however that features dual slots which take the older Compact Flash and SD cards. Nikon is the first manufacturer to introduce the memory card format into its cameras, with its professional level D4 camera. XQD was announced in December 2011 by the CompactFlash Association. It is slightly bigger in physical size than a standard SD card but can offer extremely fast read/write speeds. James Banfield from Nikon UK told TechRadar that there had been lots of interest around the new card format, "We have had lots of questions about it, but as soon as people see it in action, those questions stop," he said. "It's always challenging introducing a new format of card." To date, only Sony has announced that it will be producing XQD format cards, with other manufacturers including Kingston, Lexar and Sandisk showing a reluctance to enter the new market. Asked if limited availability worried Nikon, Banfield said, "It doesn't actually exist yet, but the Compact Flash Association has already said that it's the future, so we will see it going forward." That said, Nikon has chosen not to include an XQD slot for its semi-pro D800 camera. Banfield says that this is because the new format is being saved for its flagship model, while the D800 is a camera the company expects existing users to upgrade to. While its a fair assumption that upgrading users won't want to invest in, what is for now at least, an expensive new memory card format, it does potentially mean that professionals looking to buy a D4 and use another DSLR as a back-up device will have to cart around three different memory formats. No other camera manufacturers are utilising the XQD memory card format, though the impending Canon 5D X / 5D Mark III would be a potential candidate.